There is something, some thought, some habit in your life that no longer serves you. We set up habits for ourselves and, once they are established, they take on a life of their own. 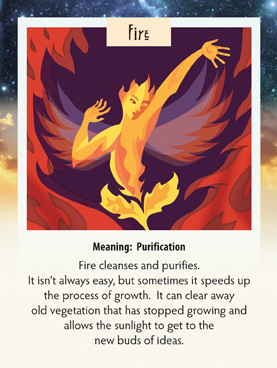 Something may just pop out at you this week and you may think “I just don’t need that anymore and it takes too much of my time and energy.” This is the week for cleaning house of those thoughts/habits/things! I love the timing of this card! I started yesterday some clearing out and look forward as to what the end of this week will be like! Yes, yesterday some confusion came up as to who to listen to concerning a health practice. All 3 sides seemed to be correct and do have their own credibility in my experiences. I felt caught in a swirl, then in meditation it wasn’t to decide who to follow- but rather to realize, in a strong way as never before, that it is really really time to feel my own rootedness and centeredness. And in doing so, then a radiance or “fire” will dissipate the confusing advice, allowing the knowledge that I came in with to manifest more strongly. It made me think, “Hey wait a minute, I didn’t come in empty you know.” I felt much better after that! Wow…yes, we all listen to you…I guess YOU should listen to you!